The Breton girl next door. Meet that sweet and innocent Breton girl next door. 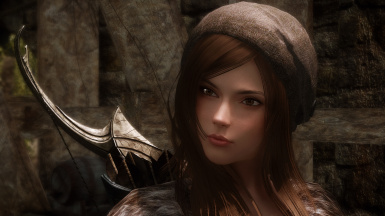 About to begin her adventure with you in Skyrim, she may look delicate, but never trust just the looks of something. 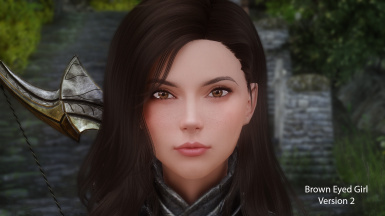 There is a fire burning behind her eyes as she seeks out Alduin and avenge the destruction and loss of innocent life he is causing. 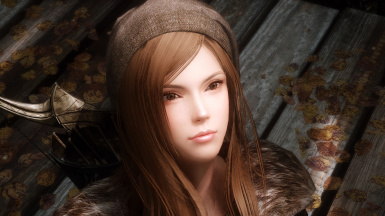 Elegant Beauty Skin (my own creation, if you don't want to use it, fair skin should work as well) Also download the reduced lip shine in the optional file section. *Note, I manually edited the SR Freckles DDS files in photoshop using replace color, so that the gray background matched the same gray background that is used in the freckles DDS file included with my Elegant Beauty Skin, this eliminated a reddish color mismatch at the neck line. Because I assume that stephierawx the creator of SR freckles would not approve of me including her edited files, you will need to make this change yourself if you really want to eliminate the color mismatch, or use a different freckle file...or no freckles. Either way she looks great regardless. If downloading using manager does not work for you, then download manually, extract the contents and place them in the appropriate SKSE folders. I have included the full folder path to make it easier to place them. Be aware that the Sculpt files are included. The Jslot file is in the Preset folder. 2.1 is the final version. No additional changes will be uploaded. Version 2.1 - Fixed a few jagged and pointing out mesh points on the lower cheek. I didn't see them until i got into low light with a fire lighting my characters face. flavor, choose whatever you like best, still uses KS hairdo) Fixed an issue with the tearduct where it was getting cut off due to overlap. Smoothed a few cheek mesh points due to changes.